Infrared (IR) portion of the spectrum spans Wavelengths between 0. 7 t 1000 microns. Based on the principle that all objects warmer than absolute zero ( 0 ° K) emit energy some where in that range. Infrared thermometers are able to determine an object’s temperature without touching it by measuring the amount of infrared energy being emitted from the object. 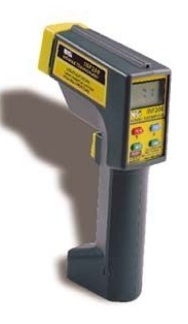 Modern IR instruments can on y measure between 0. 7 and 20 microns because they are not sensitive enough to measure the small amounts of energy available outside this range. 1. Lens to collect Energy emitted from an object. 3. Emissivity adjustment to correct for various surface finish s and materials. 6. TA , the unknown temperature , is determined from the detector temperature. Pyrometry literally means “fire” (pyros) “measuring” (metron). Pyrometers manipulate the fact that all objects above absolute zero temperature 0 K (-273.15 °C; -459.67 °F) radiate and absorb thermal energy. If the relationship between the radiation intensity and wavelength and the temperature can be established, the temperature can be found from the radiation. Two principal theories are employed by pyrometry: Planck’s law and the Stefan-Boltzmann law. Planck’s law is used in narrow-band pyrometers, where only one or a few specific wavelengths are targeted. The Stefan-Boltzmann law is used in broad-band pyrometers, where a wide range of wavelengths are measured. This is a derived formula,from the german physicist Max Planck,that portrays the amount of radiation emitted by a blackbody as theoretically determined by its temperature. It is an equation that produces a curve,termed Planck’s blackbody radiation curve,which illustrate that the warmer a body is,the greater is its blackbody emission at each wavelength and the shorter is the wavelength at which emission peak. Stefan-Boltzmann law that relates the energy,E,radiated away from a perfect emitter,to the temperature,T,of that body.It has the form E,T,where E is the energy radiated per unit area per second.T is the temperature and is the Stefan Boltzmann constant. Its value is 5.6697 10 Wm K.The law was derived by the Austrian physicists Josef Stefan and Ludwig Boltzmann. The radiation intensity is a function of wavelength I and temperature T.For a given temperature,there is a particular wavelength associated with the maximum radiation intensity. An approximate equation that relates them is Wein’s Displacement Law. Infrared thermometers measure the surface temperature of objects within their field of view. Focal length of instrument is important consideration. Asphalt, cement, and construction materials. Material emissivity is subject to a great amount of uncertainty because it depends on surface finish, color, oxidation, aging and several other factors. Objects that move, rotate or vibrate. They can measure temperatures > 1500 °C. Object of interest (food, painted surfaces). Response time is in the millisecond range.